Full story here. The comments/discussion section on this blog, below, is open as usual. Time to Publish the Arbil Agreement? What exactly is the Arbil agreement? On 13 June, veteran Kurdish politician Mahmud Uthman called for the “Arbil agreement to be published”, reflecting the considerable chaos relating to its exact nature. The problem is primarily that Iraqi politicians appear to have short memories and there are already multiple competing narratives about what the agreement is and how it came about. It can be useful therefore to revert to press reports written around 11 November 2010 when some kind of agreement between the blocs led to a decisive meeting in parliament that finally broke the 8-month long stalemate after the 7 March 2010 parliamentary elections and eventually led to the formation of the second Maliki government in December 2010. At the time, the prevailing nomenclature differentiated between at least three different concepts relating to the government-formation process. Firstly there was the process itself, which was mostly referred to as the “Barzani initiative” after the name of the Kurdish president. That process consisted of negotiations that took place both in Baghdad and Arbil. Second, there was the 15-item agenda for the Barzani initiative, which appeared to have the form of catch phrases rather than anything specific. The world watched with great hilarity as Iraqi newswires churned out optimistic reports that the political parties had agreed on such momentous items as “adherence to the constitution”, “consensus” , “national reconciliation” and “national partnership”, apparently without ever specifying what processes would lead to achievement of those lofty aims (with the possible exception of the dismissal of the accountability and justice board which was mentioned in several reports). Thirdly, the Kurds claim they obtained separate agreement with Nuri al-Maliki concerning their 19 demands for joining the government, many of which were highly imaginary since they were predicated on the outcome of parliamentary action and approval by future popular referendums. At any rate, this part of the process mostly seemed related to a bilateral Maliki-Barzani pact rather than a trilateral affair also involving Iraqiyya and Ayad Allawi. Apparently, the only signed document involving Maliki, Allawi and Barzani that was mentioned at the time was the one highlighted by parliamentary speaker Usama al-Nujayfi during the debate on whether there should be an ad hoc de-Baathification decision by parliament for three members of Iraqiyya. Reportedly, that document focused on three items: The creation of the strategic policy council, exemption of the three named Iraqiyya members from de-Baathification, as well as “national reconciliation” more broadly. Perhaps there never truly was an Arbil agreement? Today, Iraqiyya keeps asking for the implementation of “balance” in the ministries of state, as well as the creation of a strategic policy council with executive powers. But if the details weren’t hammered out at the time, Iraqiyya’s leverage is now greatly diminished. Maliki can plausibly claim that the strategic policy council is unconstitutional, as are many of the Kurdish demands. Fortunately for the Kurds, though, Maliki seems desperate to hold on to their votes and sees them as a potential pillar of the “political majority” alternative he keeps talking about. Iraqiyya are in a worse position since at least some of its members may feel tempted to remain on the side of Maliki or defect from Iraqiyya if matters should come to a head. It is in other words unclear whether the publication of what are now historical documents would be truly helpful at the current stage. Indeed, for Iraqiyya in particular it would be truly stultifying if it had agreed on such sectarian language as reserving particular ministries for “Sunnis”, since its leaders insist on maintaining a nationalist rhetoric. Maybe it would be better to simply focus on the security ministries, which must be filled regardless of what was agreed last year. Another week has now passed by without any significant progress; parliament has been postponed again until 28 June and Ramadan is fast coming up (1 August). When Ramadan comes to an end there are exactly 120 days left to decide what to do with the US forces in Iraq, and it would be good to at least have a new defence minister at that point. Ever since the beginning of the war in 2003, Iraqi football has provided an interesting contrast to Iraqi politics. For one thing, Paul Bremer’s aggressive de-Baathification campaign somehow failed to make an impact on the football union, thanks not least to some of its leading figures enjoying support in powerful international sports circles like FIFA. As a result, Hussein Said, a former star player frequently accused of close links to Saddam Hussein’s notorious son Uday, was able to win the position as head of the Iraqi football union in 2004 and stayed on in this position for six years. Secondly, the successful football team itself proved something of an antidote to the prevailing tendency among Iraq’s post-2003 politicians to divvy up positions on the basis of ethno-sectarian affiliation instead of looking to talent and merit. The Iraqi football team that did spectacularly well in 2007 featured players from all kinds of Iraqi social and ethnic background, but the composition of the team never represented any kind of proportional formula. Today’s election of a new leadership for the Iraqi football union – postponed repeatedly on political grounds since 2009 – serves as an indicator that there are still some differences between politics and sport in Iraq, but also increasingly some similarities. The new president of the union, Najeh Hamud, comes from Najaf and is mostly described as a “Shiite” although he has never made a big point of his sectarian affiliation. Until quite recently, he was frequently criticised on Shiite Islamist websites for his alleged past Baath ties, but during the past year or so some kind of personal conflict is said to have evolved between him and the previous president of the football union, Hussein Said, who is a Sunni, and whom Hamud served as a deputy. There has even been talk of backing by the Shiite clergy for Hamud, who secured promises of support from many of the representatives of clubs in the Shiite-majority areas during the past weeks. These developments – along with the fact that just last week Said finally resigned from the presidency he had held since 2004 – could in themselves perhaps be seen as constituting some kind of sectarian dynamic similar to the one seen in the Iraqi army and the state bureaucracy more generally, where Shiites with past Baathist ties have become quite preponderant as a support base for Prime Minister Nuri al-Maliki. Another candidate with a Sunni background, Ahmad Radi (who once was part of Tawafuq but later became an Iraqiyya member) also withdrew just hours before today’s election. But things are not all that clear-cut in football it seems. True, Abd al-Khaliq Masud, a Kurd, ran unopposed as first deputy of the new president in what seemed to be an echo of the politics of ethno-sectarian spoils or muhasasa. But the main opponent of Najeh Hamud today was actually another Shiite, Fallah Hassan, who comes from Sadr City. (Reports say Hamud got 45 votes and Hassan around 25.) And the second deputy to the new president is also a Shiite, Sharar Haydar, who at one point accused Hussein Said for playing the sectarian card (i.e. Said’s Sunnism) for holding on to the presidency. In this way, Iraqi football continues to exhibit certain contrasts to Iraqi politics, and today’s developments in particular encapsulate the dilemma of the Iraqiyya party, which professes Iraqi nationalism but is increasingly seen as Sunni-supported: Some will no doubt see today’s developments as some kind of “Sunni marginalization”, whereas others will see the absence of an ethno-sectarian quota-sharing formula as basis for the election as something positive and liberating. It is fair to say that the life cycle of the all-Shiite National Alliance (NA) – the all-Shiite bloc that delivered a second premiership to Nuri al-Maliki in November 2010 – has been an unusual one. In the first place, one could of course argue that when it first came into existence in 2010, the NA was really a reincarnation of the previous Shiite coalition that had existed as the United Iraqi Alliance (UIA) from 2004 to 2008 and that was partially re-launched with Iranian support as the Iraqi National Alliance by Ahmad Chalabi, ISCI and the Sadrists in the spring of 2009. But that’s another story. Suffice to say in this context that the National Alliance was actually born twice after the 7 March 2010 parliamentary elections – first in May, when INA nominally merged with the State of Law bloc of Nuri al-Maliki but nothing much happened and no name was given to the new bloc, and later in June, when the leaders of INA and State of Law tentatively began a process of selecting a prime minister candidate and claimed the position as the biggest bloc in parliament in order to challenge Iraqiyya and Ayyad Allawi (who had emerged as the biggest bloc based on the elections results). Not until October 2010, thanks to steady support from both Iran and US ambassador Chris Hill, did Maliki emerge as prime minister candidate of the Shiite super-bloc. Now the NA is dead again, or so it seems. The thing is, there is no death certificate as such , only the much-overlooked selection yesterday of Khalid Atiyya, from the bloc of independents affiliated with Deputy Prime Minister Hussein al-Shahristani, as parliamentary head of the State of Law bloc. That in itself may not sound terribly exciting but it is: One of the few defining criteria for a bloc (kutla) in Iraqi parliamentary practice post-2003 is that it must have a head or rais. Now, importantly, after much dithering, the National Alliance did eventually agree on such a bloc leader in December 2010, when Ibrahim al-Jaafari was selected. Accordingly, Atiyya’s emergence as head of the State of Law faction yesterday amounts to nothing less than a de facto secession from the NA, since the recognition of State of Law as a kutla by implication negates the continued existence of the National Alliance. It should be added in a footnote that Iraqiyya has actually moved in the opposite direction, despite lots of centrifugal forces being at work. 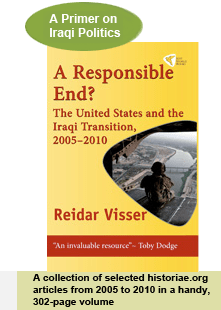 Also in December 2010, the Iraqiyyun faction led by Usama al-Nujayfi announced the election of its own bloc leader in what seemed to be tantamount to a secession from the broader Iraqiyya coalition. But since at least February 2011, Salman al-Jumayli has quite consistently been described as the bloc leader of Iraqiyya. These developments are not necessarily going to change anything in the short term. In the first place, bloc size comes into play only when the question of selecting the premier is on the agenda. Second, if Maliki really wants to reshuffle the cards and dissolve parliament, he is still in a position to claim the “biggest bloc” since Iraqiyya has shrunk by some 10 deputies over the past month through the defection of White Iraqiyya whereas State of Law has only lost Safiya Suhayl (who became an independent) and therefore is biggest with 88 deputies. But these latest moves do seem significant as possible elements in a long-term plan by Maliki to create some kind of “political majority” government to replace the current “national partnership”one, possibly based on an alliance between State of Law, the Kurds, Wasat and White Iraqiyya. Still, if that is really Maliki’s plan, he will need to convince Iraq’s president, the Kurdish leader Jalal Talabani, to support him as premier once more, which in turn could mean a demand for further concessions by the Kurds. Another question is how Ibrahim al-Jaafari, until recently the head of the NA, will react. Could the recent selection of his party ally Falih al-Fayyad as deputy minister for national security mean that a deal has been done between Jaafari and Maliki? So far the Jaafari website is silent on the issue. At any rate, any such new coalition will enjoy only a small majority in parliament. In a move apparently intended to pre-empt Sadrist criticism, State of Law today officially declared it is against any prolongation of the US presence in Iraq after 2011. The Iraqiyya Withdrawal: Towards De-Baathification Replay in Iraq? It is a sorry political menu that is on offer to the Iraqi public these days: Alternative A consists of a party that insists on calling itself “State of Law” but that holds demonstrations demanding the death sentence for suspects in the Dujayl wedding trial before the judicial proceedings have even started. Alternative B is a party that claims to be secularist and nationalist, but whose leaders see cooperation with separatist Kurds and Shiite Islamist hardliners as somehow constituting the best strategy for furthering their own agenda. Yesterday matters came to a head when Iraqiyya withdrew from the first session of parliament after a month-long recess in protest against the rhetoric of pro-Maliki demonstrators who were out in the streets of Baghdad over the weekend. What is clear after these recent bitter exchanges is that the two sides are further apart than ever. And as earlier, it seems likely that some kind of dirty shouting match about the legacy of the Baath party may set the parameters of the debate going forward. 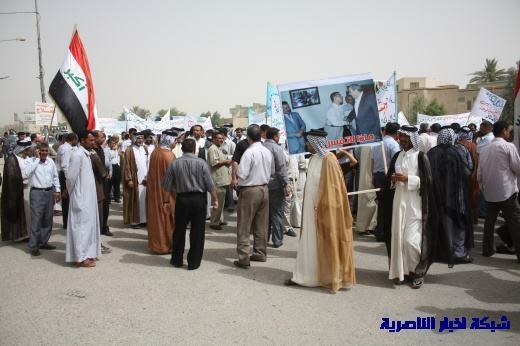 The controversial pro-Maliki demonstrations at Tahrir Square in Baghdad had featured posters with pictures of Ayyad Allawi meeting one of the persons that now stand accused in the Dujayl wedding affair – a terrorism attack that took place in 2006 during the sectarian violence at the time. Of course, meeting with such a person does not in itself constitute a crime under Iraqi law, but the problem is that the “State of Law” supporters want to criminalise people with past ties to the Baath no matter what the law may say. If the law is non-existent, they simply make one up and proceed according to their own whims, precisely as they did back in February 2010 ahead of the last parliamentary elections, when “de-Baathification” took on the nature of a primitive, medieval witch hunt without any reference to judicial process whatsoever. For further proof of the ascendancy of this tendency, one needs to look no further than to the pro-Maliki website that carries the name of his alliance (www.qanon302.net). In an ominous report two days ago, the website announced a forthcoming demonstration in Nasiriyya intended as a protest against the reinstatement of education ministry officials with past Baathist ties. The website simply said the protest was against “the return of the Baathists” that supposedly had been orchestrated by the new education minister from Iraqiyya, Muhammad Tamim. What the website failed to mention was that those reinstated had in fact been members of the Baath at the firqa level and as such were perfectly eligible to return to service under the accountability and justice law passed by the Iraqi parliament in January 2008. Yesterday the website continued by covering the demonstrations themselves, where the two hot topics had even been merged into one so that demonstrators were carrying posters of Allawi meeting with Firas al-Jibburi (the accused in the Dujayl trial) while at the same time protesting about the education ministry reappointments! What these developments show is that, firstly, political leaders in the governorates south of Baghdad have no respect for the accountability and justice law passed by the Iraqi parliament in January 2008, let alone for any concept of due legal process as such. Similar to the situation before the last parliamentary elections, they operate ad hoc kangaroo courts in which the label of “Baath supporter” – however ill defined and arbitrarily assigned – can be sufficient to attack an individual and subject him or her to almost whatever punishment the accusers may want to concoct. Second, the way the stories from Tahrir Square and Nasiriyya were reported on websites close to Prime Minister Nuri al-Maliki suggests there is support at the level of the central party leadership for the totally extra-judicial approach that is being employed. It all makes you wonder whether “the new Iraq” is really that much different from the tyranny its leaders claim to have replaced. Maliki presides over a party whose provincial leaders are fond of playing jury, judge and executioner all at the same time – and who also appear totally oblivious to the fact that by so doing they have lost whatever moral high ground they may have once possessed. In terms of their methods they are now at the same level as the torturers and human right violators of the savage Baathist police state; no longer worthy of its name, dawlat al-qanun (“the state of law”) has in reality become dawlat al-shubhat (“the state of slander”). It should be added that if Maliki’s State of Law has become a contradiction in terms, things are not looking brighter in the other camp either. Iraqiyya is courting Sadrists and ISCI: This might well have the net effect of these groups joining together to throw out the very Americans whom many in Iraqiyya would probably rather prefer to stay a little longer. (By the way, in this situation, how can the CIA boss and the US ambassador in Bagdhad be so cocksure that a demand for a prolonged American military presence is indeed forthcoming and that the Sadrists constitute the only obstacle??) As if just to underline the utter futility of Iraqiyya’s strategy of once more making friends with these strange bedfellows, Humam Hamudi of ISCI – one of the parties courted most frequently by Iraqiyya as part of their “opposition alternative” – yesterday expressed a degree of sympathy for the anti-Allawi demonstrations staged by the Maliki supporters of the weekend! Unless Maliki dares to confront ugly vigilante tendencies in his own “State of Law” coalition, and unless Allawi can get real about the alternatives before Iraqiyya, the current stalemate in Iraqi politics may well continue for a long time to come.